Posted on January 20, 2012 by troy P.
C and I keep secrets from each other. 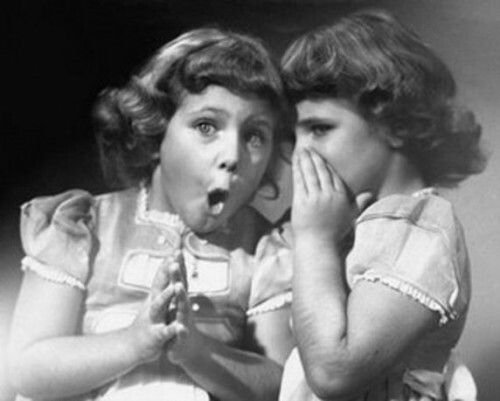 Well, they’re not really “secrets” so much as they are simply things that are never expressed. I know it’s confusing, so let me explain. A secret is something that you do in private, afterwards covering up any evidence that the deed was ever done. With C and me, what is done in private is never covered up per say, but never exposed either. It just sort of lays there. Noticed if looked for, unnoticed if not. How do I know? Well, I look for it, of course! Yes, I have the “wonderful” attribute of not being able to trust anyone fully at any time. A family trait I place firmly upon the shoulders of one – and only one – relative (thanks mom!). True, I am a child no longer, and responsible now for my own hang-ups, hiccups and snafu’s, but still I wanted to at least acknowledge the fact that my issue is much more imported than homegrown. Much more nurtured than natured. I’m not sure where C gets her “issue” from. But for her part, she has this drive – this undeniable and unrelenting force – to be her own woman. Her own person. No matter how close she will ever be to anyone, that anyone will do well to understand that there will always need to be at least a small little mental room that is all her own. Sort of like an attic with a hidden door, and a window for only her to look out of – and in through. I know that as her husband, I should be that anyone, and I should heed my own advice. But the little old paranoid Polish woman takes over my mental steering wheel far too often and drives me – us – smack dab into yet another wall of marital suffering and strife. I’m working on it, but it quite often feels like C’s patience (not to mention my own) is wearing thin on this bit, and I can almost see the suitcases being prepped for the packing of a one way trip out. “So what types of ‘secrets’ are we talking about here then?”, questions the therapist who may happen to be reading this, while stroking their chin in a majestic, yet intelligent fashion. Well, take for instance this very blog. C knows of it, and has even been “invited” to peruse if she’d like. But she’s never actually been given the web address. No, she’d have to access it through my phone app, I suppose, in order to actually read the damned thing. And similarly, C too has various social medias that she makes use of. I only know that because of my tendency to “look”. Which equates to my sneaking about and digging through any number of apps and histories for some sort of sign. One that proves that the one who I love the most is most assuredly getting ready to high-tail it outta here. Or to begin carrying on with another. One who is richer, better looking, nicer, better with gardening… you get the point. So, while she never told me about these creative outlets, I “found” them. And when she found out that I had done so, the cat was out of the bag – and not-so nicely slammed up against yet another wall – little old paranoid Polish woman-style. As a result, much like my offer to her, she made it clear that I am free to sift through any of the rooms in her online world, but I can only enter through the front door that her phone provides as well. And while it’s most likely obvious, it should be noted still, both of our invitations to each other were presented in a spirit very similar to that of how a five year old would normally “apologize” when they realize that desert will not be forthcoming without first a mention of regret. With very much a “here’s your hat, what’s your hurry” flavor to boot. “Now, hold on just a flip t, what gives with C not being able to have secrets, but you’re being able to?” I’m glad you asked. Because that was the very question that gave birth to this post. Why IS that? Why are my secrets-that-aren’t-secret totally harmless, but her secrets-that-aren’t-secret surely to be the cause of our demise? Why are the things I do but don’t make mention of quite fine and/or dandy while her activities must be called into question and monitored ceaselessly? I suppose if I had to answer that, I would first look downward and shuffle my feet while sheepishly making some sort of excuse about how my actions (which are no different from hers) were somehow inconsequential because they were only first and foremost in reaction to hers. And besides, I don’t mean any harm by them. I would then inch slowly backwards and hope to get clear out of the room before your dropped jaw worked again, and you rebutted with the obvious fact that her actions most likely don’t mean any harm either. But there is another little twist as well, and it might serve to at least salvage a bit of the reputation that I pretty much just cut off at the kneecaps with this post. Part of me doesn’t trust. Anyone. It’s true. It’s ugly. It’s the second biggest thing I hate it about me, and I would wish anything in the world to be able to be rid of it, if I could (and I just might be able to, some day). But another part of me is jealous. Jealous of that attic. That attic that needs to be there for C, for her well being and her mental health. That attic that I need to respect and acknowledge, but never access. That damned attic that will go to the grave holding a piece of C that I will never be able to know about. To experience. To touch. To love. I’m pretty sure I might have a similar room myself. 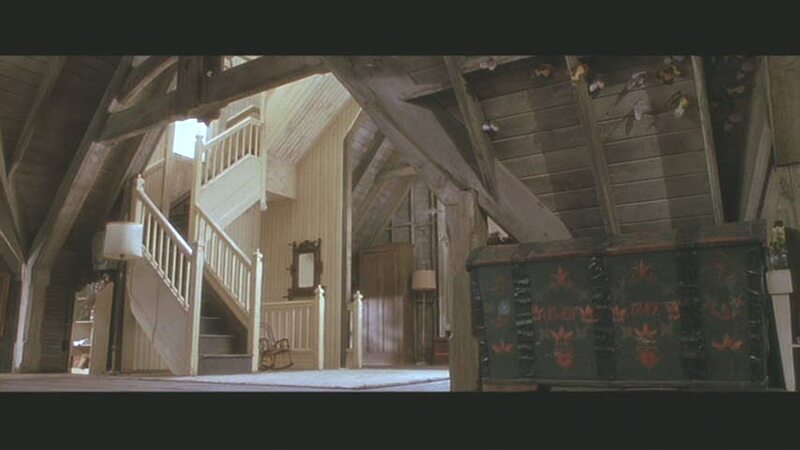 But I suppose I see mine as more of a basement than an attic. More littered with trash than adorned with treasure. And I suppose maybe that is the REAL problem in all this. Maybe it’s not just C’s attic I’m jealous of, maybe it’s C herself, for having her attic. For having her self. And maybe if I want to stop slamming us (not to mention innocent cats) up against walls of marital suffering and strife, I need to recognize that. I need to let C be free to have her secret life. Just as she allows me to have mine. Posted on January 16, 2012 by troy P.
My dad is dying of lung cancer, and I started an anonymous blog to help me deal with his impending death. That’s words 1 through 21. The blog eventually became more of an anchor than a balloon, more salt than salve. I was spending too much time pondering a death that had not yet occurred, in lieu of celebrating a life that was still going on right before my eyes. So I decided to let the blog go. But not before it brought about one pretty surprising realization. That’s words 22 through 93. The realization was this – I loved writing. So much so that I created a second blog to further explore other topics and interests. As with the first, it was anonymous in nature. Partially because I’m rather reticent, and partially because I wanted to be able to be honest with my thoughts (which translates to: I would hate for someone to read the words and – knowing the man behind them – determine them to be lies). That’s words 93 through 175. Of course, while it began anonymously, it wasn’t before too long that I wrote a post I was particularly proud of. One that seemed to get good feedback, from all but one. The one, I realized that I needed the positive feedback from, was my dad. The very man who started the whole thing in the first. The man whom, I suppose, I’ve been seeking approval from my whole life. So, I scrunched up my best “determined” face and boldly decided to print the one post that thrilled me so and present it to him, thus “blowing my cover”. I made it very clear to him that this was a secret and that he in no way could tell anyone about this besides mom (you always have to exclude telling mom in promises like this, since there hasn’t been one instance in over forty two years wherein a secret given to dad, has not at some point then been brought up in conversation by mom). To date, he has kept our secret – with the mom clause being taken advantage of – and as fate would have it, they both loved the post even more than I. That’s words 175 through 377. Of course – with mom being mom, and dad being dad – they made mention of the fact that this was truly worthy of being published, that people needed to be able to see writing such as this. When I tried to explain to them that it actually was already “published”, and viewable by the public, mom came back staunchly with “well, I’m talking about all of us who don’t have the internet”. Now, I love my mom, but I’m not to sure if she realizes that the “all of us” without internet is – at this point – really much more “her and dad and maybe another retired couple somewhere in the west coast – you know, for balance”. That’s words 378 through 503… Come on, wrap this thing up. So, at mom’s request, I promised her that I would submit the post to our local newspaper, to see if I could get “published”. I went (online) to submit it, only to find out that they had a 600 word max. My posts average about 1,200 words, and this one was no exception. Mom was upset to hear the news, and to help soften the blow, I promised to try to write a post that would fit within their requirements. This is that post. Now at word 598. I suppose that if the paper does publish this, my cover will be forever blown and my secret out. And I suppose that the promise of that occurring sort of scares me – maybe even to the point where I might “accidentally” sabotage the post, to help prevent it from ever seeing the ink-and-newsprint light of day. But that is not at all why I am now up to writing word 670. Nope, not at all. Terry Snyder and his Guns! Of Navarone! Posted on January 13, 2012 by troy P.
I simply loved The Guns Of Navarone. No, not the movie, although it was pretty good. Well, actually, the follow up hit “Force 10 From Navarone” (starring a very young Harrison Ford, who was still at the time getting over his new-found Han Solo high) was really much better. But really, that isn’t the point at all, and I don’t believe I’ve ever digressed this early on in a post before (please don’t tell me if I have – a fella’s got his reputation to consider, you know). Anywho (or, as I suppose an actual writer would say “at any rate”), The Guns Of Navarone I’m thinking of wasn’t the International Ska hit that resulted from the movie either, even though I do find myself humming both The Skatalites and The Specials interpretation of it from time to time. And yes, there is so too a difference between each version – slight – but recognizable none the less. 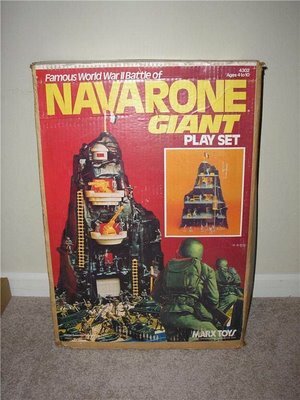 No, the “Guns Of Navarone” that I’m speaking of is actually the 70’s era play set put out by the folks at Marx. THE play set to beat all others. I distinctly remember first and foremost the overwhelming size of the box it came in. And while many other play set boxes made promises of good times to be had within, the Navarone slick did not fail to deliver. Now, I’m sure that the actual container was no greater than three feet in height, but at my young age it seemed to have damned-near touched the ceiling. It had to be big, to contain the mountain within – an item made of grey molded plastic – one solid piece. Light enough to be moved around easily by a young lad of sixish (? ), but big enough as to provide for hours (if not days) of non-stop imaginary warfare. Like many of the other play sets of the era, this came with a plastic sheet that had some sort of cartoonish geography slapped carelessly upon it. And like many of the other play sets, this item served only to make my mother nervous that we might somehow be suffocated by it. Don’t ask. Just. Don’t. Ask. She needn’t have worried however, since again, like those from most of the other play sets, it was usually trashed by the end of the first week. The set came with a full compliment of Germans (or “bad guys”) molded in grey, and Americans (“good guys”), molded in green. The mighty guns atop the mountain were a very realistic day-glo yellow (of course) and there were flimsy plastic flag masts – of the same color – included as well. By far, the Germans had cooler poses, helmets and “gadgetry”, but I knew that was all just a ploy to pull me over to the “dark side”. The Americans didn’t need cool poses to show how tight they were, I suppose, but there was one in particular that I eventually just had to show to my dad for clarification. The soldier in question was the one who seemed to be walking forward – gun raised high above his head – possibly in an effort to boldly stab a giant in his kneecap, or maybe kill a tree. My dad explained that the men positioned like this were so because what they were actually doing was wading through water, and the guns were raised high to keep them dry. The play mat didn’t have nearly enough “water” to place them all in, and I’m still none to pleased with their inclusion as a result. Conversely, my personal favorite were the soldiers who were carrying the stretcher. I liked them because they “walked” in a fashion very similar to my own, only I do it without the aid of a stretcher. The set was loved so much that after the first was literally worn out, a second was brought in to relieve it. And as with the first, the damned plastic mat didn’t survive even a week. So, what’s the point here? None really, I just happened to remember the play set, oddly enough, with my recent purchase of a three disc set of Enoch Light’s “Persuasive Percussion” series. Five long-playing albums in total, strung out over the three discs, with each and every song being arranged and played by Terry Snyder and his All Stars (brief side bar: there seem to have been so many musical groups of the lounge era who used the moniker “All Star”, and yet damned few are remembered today. That doesn’t seem very Allstarish now, does it?). At any rate, I purchased this musical gem knowing full well that I already owned all the material on the first disc and a smidgen of the second. I know that that seems to go against my usual bent of not allowing myself too much guilty pleasure, but with a price tag of under fifteen dollars, I gladly got myself down from the cross this time and indulged. And am I ever glad I did! The three discs contain a total of sixty tracks, with not a bad one in the lot. 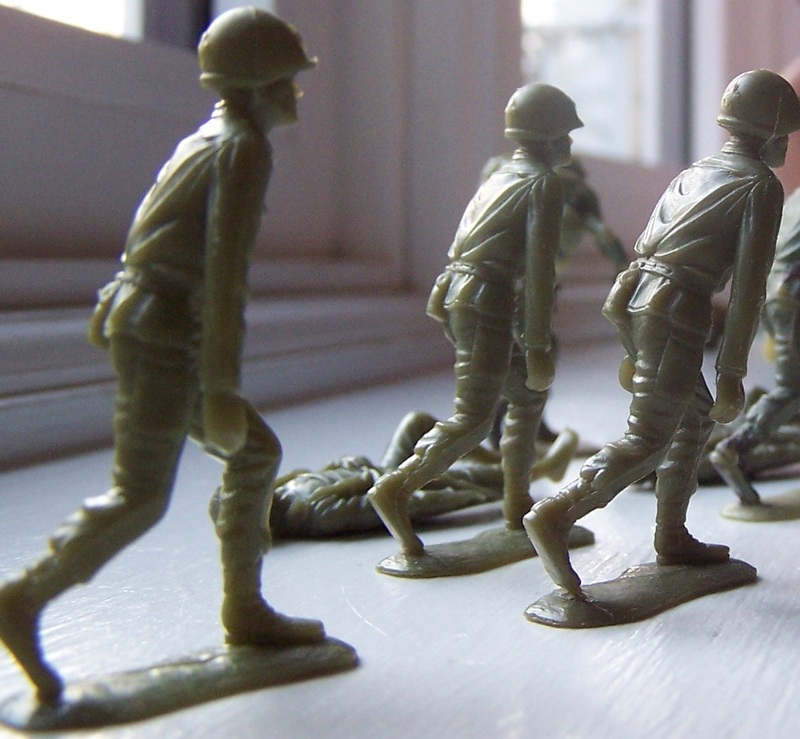 No matter how hard I try, none of these “soldiers” can be found to be in awkward poses. Honest and true lounge, the hits include “Hernando’s Hideaway”, “Brazil”, “Perfidio” and a bevy of other tunes that sound all the better with the use of bongos and those other instruments normally associated with latin percussion (no, I have no idea what any of them are called. And no, I have no desire to look them up for the purpose of this post. Let’s just say that there’s a whole lot of chicka-chicka, bongo-pop and reeka-reeka cacophony that results when they’re used, and the albums are simply delicious to the ears as a result. All crazy mamba jamba rhythym, but with a wafer-thin air of nonchelance and a wink of cool confidence still intact). In addition to the music, there’s the whole idea that – while for years, Mr. Light has had his name emblazoned all over the stuff (and therefore given the credit – as can be seen by the accompanying link) – it was actually Mr. Snyder that pulled through with all the hard work and the creativity – Bob Crewe, take note. Trust me, after hearing Enoch Light’s stuff sans Snyder, it’s plain to see Terry as being the mastermind and mad scientist in charge of this musical treat. Once again though, fame trumped talent – and that very much appeals to my still jaded though aged punk rock leanings. Posted on January 4, 2012 by troy P.
Marlette recently gave me a book. Well, “Marlette” isn’t her real name, but it’s the name chosen to describe her. A name that is as singular as she was – is. A name that will stick in your head, long after my name is gone from your memory banks. Oh wait, you don’t know my name, so I suppose that last point is sort of moot. Never the mind. Growing up, Marlette was to me the Punk Rock Queen of my little suburban jungle. Despite all the others (myself included), Marlette was the real deal. And despite all the others (myself included), she treated me like I mattered. Like I had something to offer. Possibly the first to ever do so besides the most decidedly Not Punk Rock Queen Debbie. A could-have-been-friend from grammar school (but I was an idiot in grammar school, and pissed away my friendship with Debbie by picking on her mentally-challenged brother, all in a vein effort to gain an acceptance from the rest of the class. An outcome that was ultimately unrealized, and a story I am still far too ashamed to tell, even though I have a gut feeling that one day Jesus will want to have it recapped). Anywho, Marlette and I grew close enough that the one day she abruptly ran from the classroom in tears, Mr. K. (a VERY cool person in his own right who was a math teacher by trade and happily married, yet soooooo gay. He had an unbridled love of Tina Turner and sported a bolo tie while having a paper skeleton hanging from his wall that he called “Karen Carpenter.” I know, it’s not funny, but we all thought it was at the time – the skeleton bit, not the bolo) gave me the immediate task of running after her to see what was the matter. And I did. What followed was a conversation I can’t remember, but an honor I never forgot. She was possibly the first true best friend I ever had, and one that – while occasionally slipping from immediate memory – has never left my heart. Via the wonder of facebook, we reconnected many years after our youthful adventures. And while the majority of my high school friends have long since unfriended themselves as a result of me unfriending them, due in part to our never actually being friends in the first place, I have never once allowed Mrs. Marlette (now married to a good man who shares with her a beautiful daughter) to slip away. So, this year she decided to drop off a used book at my house that she happened to have two copies of. A book that she had promised twice before, but twice before had been unable to deliver. This time however, with beautiful daughter and a rather silly dog in tow, she decided to slowly drive down my street (as a result of her not remembering the exact address), in the hopes of finding “something telling” about my abode that would make her realize it was my house (she mentioned the possibility of there being a large anarchy “A” emblazoned upon our front window or some such thing to that effect. I have no idea why…). Rest assured, there is nothing particularly notable about my house, outside of it’s being a color that while I could SWEAR is grey, C knows FOR A FACT is blue – and based on this alone, Marlette would have never found it. To her surprise and mine however, I just happened to be leaving my house at the EXACT moment she came into view, so my eyes were already trained on the crazy Ontario plates (we’re used to seeing them up here) that I saw attached to the car that was coming at a painfully slow (even for a Canadian) speed down my street. When our eyes met, I knew, and so did she. All those years later and she hadn’t aged a day. Well, that’s not true. That would be rather stupid, in fact. She has aged, but she’s aged well. Much like former Marine Corps friends I have reconnected with (and unlike many of the high school ones), she is a wholly new person as a result of years of experiences, and yet still totally true to the Marlette I once knew. In short, she’s allowed herself to grow, but without losing sight of who she is. Past the surprise of recognizing and meeting each other literally in the middle of the street, we shared a brief moment, a hug and an introduction to a beautiful daughter and the rather silly dog – neither of whom felt very talkative. A one-way present exchange later and she was on her way, her Ontario plates back up to a New York speed and vanishing from view. It was a mere several minutes spent between us, and I was OK with that. She is still the “Punk Rock Queen” of my youth, but I’ll never tell her that. In part because I don’t feel she’d be too pleased with the crown. I’m none to sure she’d be cool with crowns of any sort, actually. 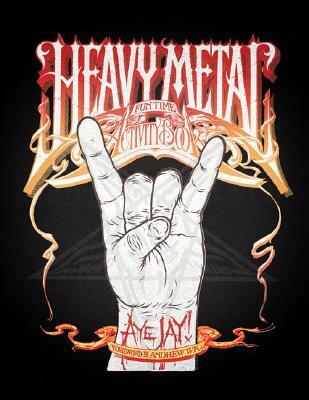 The book she gave me turned out to actually be two – one devoted to Heavy Metal coloring activities (didn’t know that existed, did you? ), and the other, the one promised twice before titled – as you might have guessed from the picture above – “Roman Candle”. 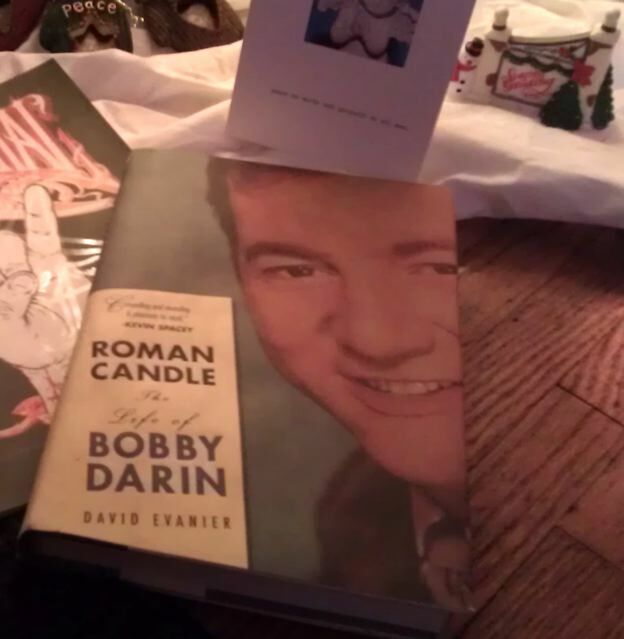 A book (my fourth to date), about the life and times of Bobby Darin. The original intent of this post was actually to describe some of the things I have been discovering about B.D. as a result of obtaining this book, even after having already rabidly read the three others I already own on him. I may still at some point decide to put all those nuggets of info into a post for you (be forewarned, a great deal of it ain’t pretty – and some even less so). But as for this post, I guess it has turned instead into a recollection about Marlette and how having one good friend – one great friend in fact – can help you to make a life worthwhile. And while – even after reading four books about him – I still don’t truly “know” the man, I’m thinking that Bobby would be pretty cool with the idea of being bounced for something as important as that.